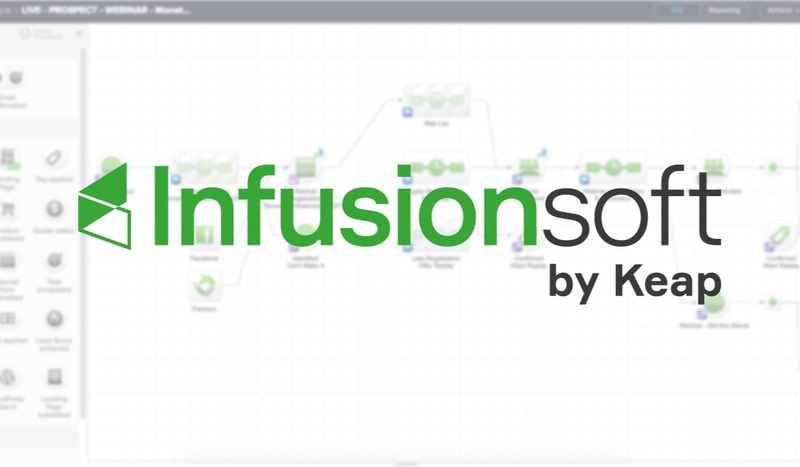 Infusionsoft is an all in one marketing and sales system targeted for small businesses. What does all that really mean? Let’s take a closer look! This platform can be a central business software as it performs multiple functions that can ultimately solve some of the following challenges small businesses have. Wasted Hours/Inefficiencies/Long Hours – many small businesses are performing the same actions manually in their businesses every single day. For example, manually writing out an email in response to a sales enquiry. This results in unnecessary higher labor costs and/or missed opportunities as your buried in the admin of your business. Lost Revenue – you may be capturing some leads, but potentially you’re not getting them all. Even worse, many leads that you are getting are falling through the cracks L If you think about the last 30 days, how many leads have you not followed up with that you should have? If you don’t have a solid automated follow up system in place then you’re losing leads and sales every week. Manual/Inconsistent Processes – doing anything manually increases the chance of error and doesn’t create a consistent experience for your contacts. This could mean some contacts have an exceptional experience, while others are running for the hills! Or some leads could have lots of interaction with a sales rep, while others have none or little. Failure to automate processes may impact your ability to capture, keep and convert more leads in your business. This may also impact on customer retention. Cannot Scale – could you handle a 10x growth in your business overnight? A lot of businesses can’t. By systemizing your business, will allow to serve more people and make a bigger impact in the world. The functionality available with Infusionsoft is split up into these 8 areas. Let’s take a closer look at each area and how Infusionsoft helps to make this easier for small businesses. Want to double your business but unsure if Infusionsoft will help you get there? Click here to book in your Free No Obligation Consultation today. Lead generation for any small business is critical, and Infusionsoft covers multiple ways in which lead generation can be achieved. Landing Pages – if you don’t want to pay for an additional monthly subscription, you can utilize Infusionsoft’s mobile friendly landing pages, that you can host on your own website. Leads can sign up (e.g. with their first name and email) and be automatically added to your database and be triggered into automatic follow up. Web Forms – if you prefer to host and design your own landing pages OR integrate with another landing page tool, you can use web forms to capture core contact details. Scan Business Cards – ever been to a business event and get heaps of business cards of prospects who want some follow up material? With the Infusionsoft mobile app, you can scan a business card (or multiple cards) and the contact details get automatically updated on the record, you approve and then they are added to your database (instead of having to type out all the details yourself). Import Leads – if you’re transitioning from a different system or if you’ve got a bulk number of contacts that you have permission to market to, you can add them in bulk via a csv file into your Infusionsoft app. 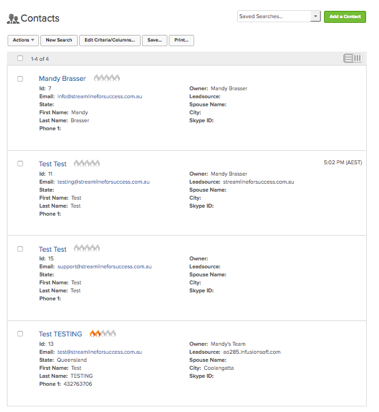 Manual Ads – you can add individual contacts directly into your database. Some businesses take this a step further. We have setup a custom form for many clients that guides a staff member to capture key information about a contact so they know exactly what data must be completed on the contact record (see snapshot of example). Tag Goals – other software available can trigger a contact to be created and a tag applied to their record in Infusionsoft. SMS Optin – If someone texts in a keyword, they can also be added to your database. Other Systems – there are other systems and options available that integrate with Infusionsoft as well e.g. Facebook Lead Ads. Please note with other external tools, there may be some costs involved (but typically no extra cost from Infusionsoft to use those external tools with the platform). 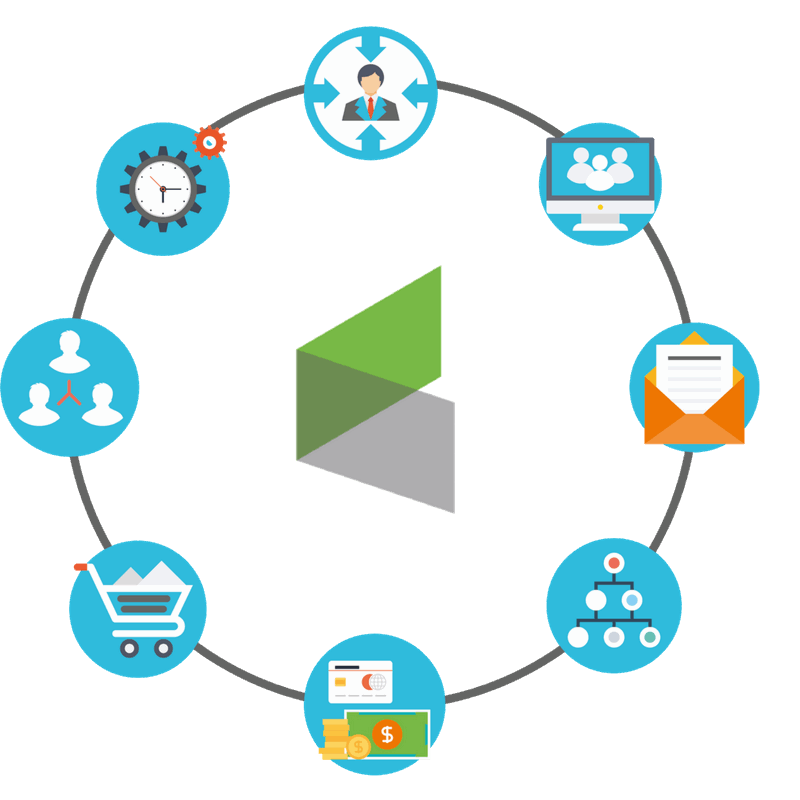 Those are just some ideas that you can use Infusionsoft for lead generation. Once a contact has been added to your database, Infusionsoft performs the function of a CRM (Customer Relationship Management). 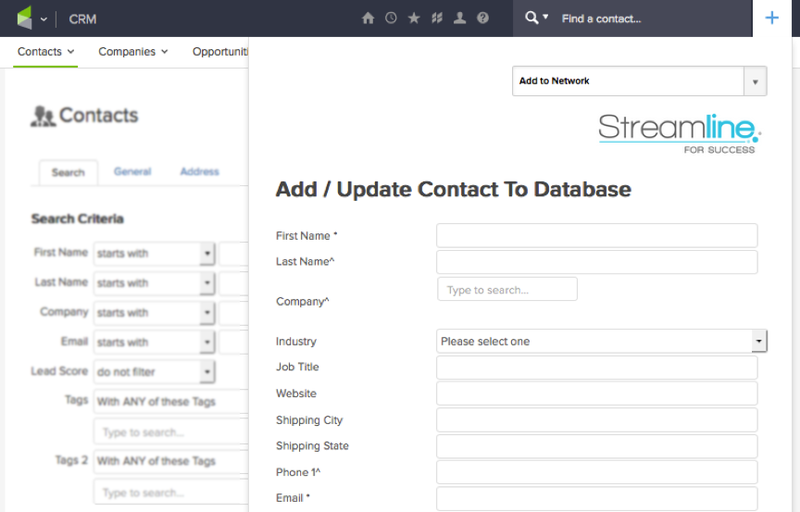 This allows businesses to stay organized by having all their contacts in one central database. Also, historical interactions are recorded such as when appointments/ calls/ tasks/ emails have taken place, repetitive tasks can be automated and alerts can be created for future actions whether it’s an upcoming appointment or task (e.g. prospect follow up). Also, using Infusionsoft as a CRM, you’ve got the ability to have a master calendar that can integrate not only your appointments but tasks as well. You can get a snapshot of what you need to do and when on a consolidated calendar or list format. By having one system that has a CRM in addition to other functionality, allows a one-stop shop for a small business to manage their contacts and get visibility of their interactions and future follow up that’s automated. 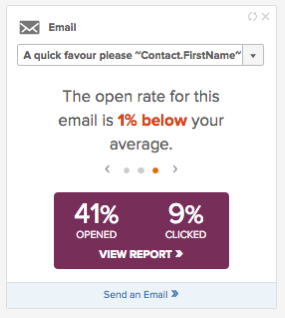 One of the core functions of Infusionsoft is being able to send bulk emails to a group of targeted contacts. This is achieved in the email broadcast feature. You’ve got the ability to select different segments/contacts to target your bulk emails, which is incredibly helpful to make sure that you’re communicating with your contacts with information that is relevant to them. 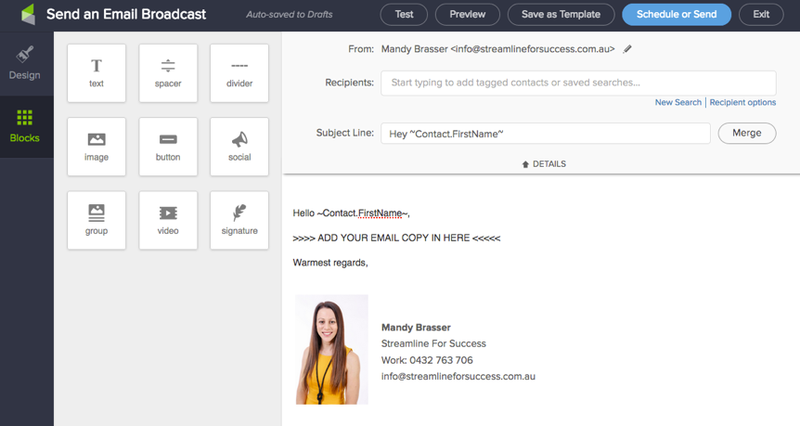 In the email broadcast area, you can easily write an email, insert images, buttons or hyperlinks, test the email and preview on desktop and mobile device. When you’re ready to send, you can either send it immediately or schedule the email in the future based on your time zone or the time zone of your contacts. For example, if you select to send an email at 10 am on the contacts time, then any contacts in Australia will receive this first, then the UK will receive it later in the day due to the time-zone differences at 10 am local time. Infusionsoft also provides useful reporting on your broadcasts, so you can see how many got sent an email, open rates, click through rates and opt outs if applicable. Infusionsoft drag and drop Campaign Builder is like Christmas day for a little kid! Ok, maybe that’s going a little far! 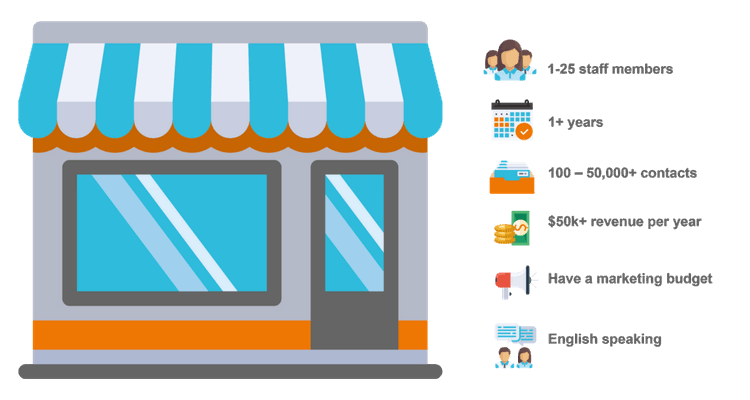 The Campaign Builder allows users to map out their marketing, sales and other internal processes, so you can visually see how elements relate to each other. All users have complete freedom and flexibility to use campaign builder to setup automation for anything in their business, as they can start with a blank canvas. If that sounds a little too daunting, users can also download existing campaigns from the marketplace for free, customize and launch them. 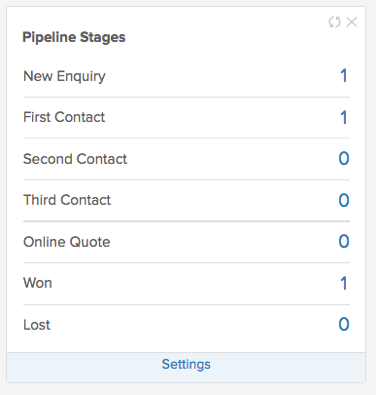 One of the fundamental principles of Campaign Builder is that it’s built on the concept of building out a workflow and having goals along the way that contacts need to achieve to transition through a process. If they don’t achieve a goal, they can be reminders as often as you like to achieve that goal. For example, say someone signs up for a free lead magnet. You might have the next immediate goal is that they download the file. You can setup a couple of reminders over a course of a week politely reminding them to download the file. As soon as they do, all reminders will stop and the contact will continue on in the process to whatever the next desired goal you want them to achieve. This becomes incredibly powerful when you break down all the processes in your business and setup follow up to target individuals to take specific actions depending on where they are up to. In addition to the ability to setup processes, campaign builder also provides visibility of this information. You can view who has achieved certain goals, how many are active in a particular follow up, how many have completed a follow up but didn’t take the action we wanted to take and more. Campaign Builder is incredibly powerful as ideally you set up the automation once and then Infusionsoft takes care of rest automatically for you – happy days! Got questions about Infusionsoft specific to your business? Click to book in your Free No Obligation Consultation today. Let’s see if this tool can help double your business like it has done for thousands of others. If you are handling sales enquiries manually, Infusionsoft also has the Sales Opportunity module (that further supports any automated sales follow up that you may be doing online). For example, if your business needs to convert your leads via phone/sales call/send out quotes, then you will potentially want to take advantage of this functionality. Sales Stages – the ability to define your own key stages in your sales process and customize the system to cater for these (e.g. New Lead, Contacted, Working, Closing, Won). Checklists – can be used for each sales stage to outline what the staff member must tick off to progress the prospect through to the next stage. Round Robin – this is incredibly helpful to distribute leads amongst your sales team. You can set this up as soon as a lead comes in it automatically assigns the first lead to Sales Person #1 and then the next lead to Sales Person #2 and so on and so forth. There are different round robin groups as well as round robin rules that you can setup to suit your business sales team needs. (Of course, you can also have all sales enquiries go to the one person if you have one sales rep that handles all your sales enquiries). Conversion – curious how long it takes an opportunity to move between stages and what the percentage conversion is between each stage AND how each of your sales staff is performing? Infusionsoft also tracks this data to help you manage your team more effectively with accurate sales information. Forecast Revenue – Each opportunity can have a minimum and maximum potential revenue value assigned. You can also flag in the system if that amount is committed to the forecast or not. This helps a small business understand what’s in their pipeline and if you need to do more marketing to generate more leads etc. Send Quotes – have products/services that you sell via quote? You can send through an automatic quote to your prospects and have they accept or decline your quotes and can be taken through to arrange payment if required. Visibility – as a business owner, you’re incredibly busy. Infusionsoft allows you to setup your dashboard widget to gain visibility of how many opportunities you have in each stage, plus other reports to help you understand how your sales process is going. 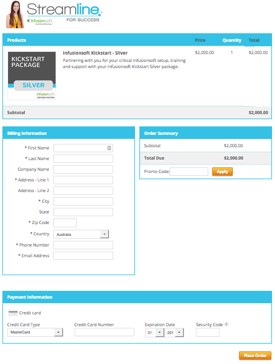 Infusionsoft’s Ecommerce module is designed to make taking payments easier for small businesses. Payment Plans – if someone cannot pay a one-off product/service in one lump sum, you have the ability to split out the outstanding amount over X number of payments (and include an admin charge if you wish). This all happens automatically. Payments – ability for contacts to pay online (see order form image), a staff member process payments or to track purchases that have come through. Ultimately you can sell 24 | 7 if you want! Billing Triggers – setup automatic reminders for your credit cards payments. If the card is due to expire, prompt customers to update, or if credit card payments fail for a subscription/payment plans, you can be notified and/or send automatic notifications. Integration – the last but probably the most important one! The ability to integrate your automated follow up with acknowledging a purchase has occurred. This is critical when building a marketing funnel that includes the purchases of a product. As soon as that purchase has been made, the contact will no longer receive follow up prompting them to purchase and will flow into the purchase confirmation/delivery sequence. Tax Invoices – invoices/receipts can automatically be emailed to clients, reducing your need to have to complete this step manually. Infusionsoft also has referral partner or as also known affiliate capability. This allows users to recruit other people to help promote their products/services. 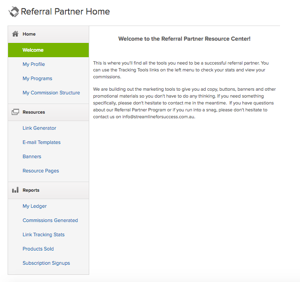 Referral Partners are given a designed login to a referral partner center where you can host material for them. 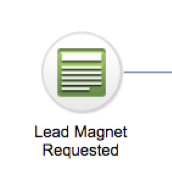 You’re also able to create unique links for tracking referral partner leads. All contacts on your database can have a referral partner assigned. You have the ability to set the commission amount/percentage on products/services and setup some other rules for your referral partners. Finally, you’ve got a referral partner ledger that tracks all the amounts owing, paid and outstanding. The referral partners module can be incredibly helpful to track the activities of your affiliates, understand which leads are coming in from where and reward your partners with commissions. Infusionsoft has many cool things that I’ve shared already, but here are some other useful functionalities that’s worth flagging. Segmentation – with an unlimited number of tags that you can create and then assign to a contact, you can utilize this system to help identify and segment your list with different interests and activities for each contact. As you start to gather more data on your contacts, this allows you to target the right people at the right time through segmentation. 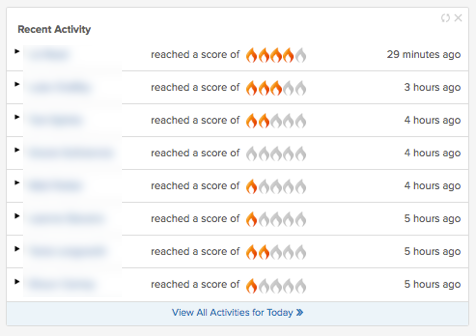 Lead Scoring – you can also set your own criteria to help determine when you define that someone is cold, warm or hot. This allows you to focus more attention on the hotter leads than perhaps the colder ones. Dashboard – you can completely customize your own dashboard by setting up metrics that are important for you to track e.g. # optins, database size, recent activity, and the list goes on. We worked with about 100 businesses over the years to help them automate. Here is a couple of our favourite examples of businesses successfully using Infusionsoft. Fiona Keary came to us to set up Infusionsoft for her personal styling business. As with any new system, it’s important to get any optins that you have out there moved to your new system, so new leads can be captured in the right place. Sacha Millar from JDMA Property Consulting & Valuations (which was since been acquired by WBP Property Group) based in Brisbane, Australia provides her personal account of using Infusionsoft. As Sacha mentioned, having a nurture campaign in place has been critical to their business. It’s been setup once and allows leads/past clients to have their business in their mind, add value and has provided many sales/referrals for them. We’ve worked with Sacha on some other campaigns, but this one is truly one of the best long term nurture campaigns I’ve seen setup – they are adding tremendous value to their list, it’s consistent, plus they are signing this impact their sales. When we first started working with Leanne Stevens, she was doing most of the sales calls in her small team helping people migrate to Australia. We could setup the sales functionality, so she could have her team conduct and manage the sales process, while she then could take a step back, view the performance of her team and manage accordingly. Simone Baldwin came to us and she was selling an online course and wanted to automate the release of content so once someone signed up, they would be drip-fed the program content via emails over a period of time. We’re incredibly fortunate to work with many small businesses, you can check out some more testimonials here. Book in your Free No Obligation “Double Your Business” Consultation. Talk directly with Mandy Brasser to see if you can double your business using Infusionsoft. Click here to book your free consultation now. Infusionsoft – Who It’s Best Fit For? Infusionsoft is a versatile platform with a lot of freedom and flexibility to setup campaigns to work for your industry and business. As a result, it works incredibly well for a range of different businesses (as you no doubt got a sense above). It does not mean that it doesn’t work for other businesses, but these are the most common industries that use Infusionsoft. I’ll be honest it isn’t the cheapest on the market, however, so often when a business is tossing up a software solution decision, we can help them assess if the software can pay for itself or even get an ROI. For example, saving on labour costs automating manual work, converting one more lead per month, retaining customers for longer and the list goes on. If you plan on growing and want to avoid the setup of two different systems and a painful transition period, it might be worthwhile getting Infusionsoft from the get go. (Particularly as some competitors it is cheaper in the short term, but as you grow your users, database size and send more emails the costs become astronomical compared to Infusionsoft). Infusionsoft offers a few different pricing options depending on the functionality that you’re looking for. Click here for more details on Infusionsoft pricing. If you’re curious if Infusionsoft might be a good fit for your particular business, click here to book in a Free No Obligation Consultation with Infusionsoft Certified Partner Mandy Brasser. Happy to answer any questions that you may have and see if there are opportunities for you to double your business by using this powerful platform. 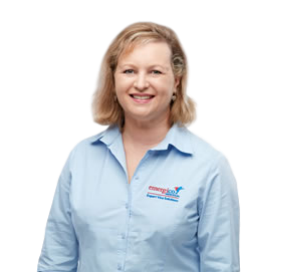 Alternatively, give Mandy a call on 0432 763 706.